Supplies: Pair of husband's old jeans. Started to basket weave my husband's terribly old jeans. I wanted to make a jacket but ran out of denim for the sleeves. For now it is an amazingly textured vest. Look forward to finding another pair to add sleeves. 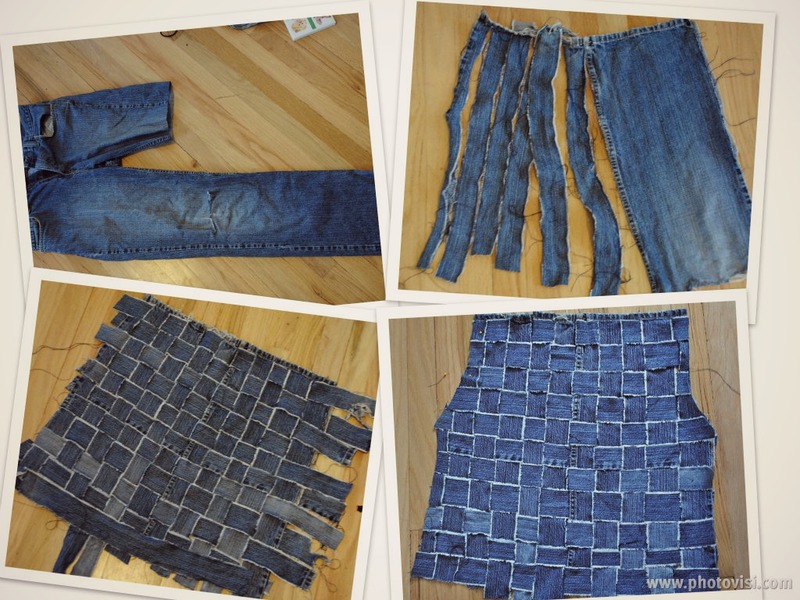 Cut denim into panels. Rip strips leaving an edge intact. Cut extra strips and weave. Cut pattern. Pin all edges and sew all around...Put together. I just sewed the side seams and collar/hems, it will be a little loose depending on the fabric...denim is durable and holds well together. I didn't sew along every piece, just weaved them. you are the best in giving trash a 2nd life! love it! You are very creative dear! I would never of thought. That jacket is so couture! So 90s cool! Adore it!! yessss! That's what I got! Thanks Jackie! AH this is AMAZING. How'd you do the holes for the arms and necks? Hi! I made 3 panels and then cut a pattern of back bodice, 2 front bodices. So no holes, just a pattern. Awesome and thanks! Great to here I have readers from all over the world. Happy Mother's day from Oregon! Think I will hit the thrift store for some old jeans. I want to do a pair of boy shorts this way. Great vest - looks good wth the sweatshirt - what about sweat shirt sleeves instead of denim? Hey I was thinking about the front of the vest? how does the front look? and I really want to make on my self, but how does the front look? is one pair of jeans enough material or do you need more pairs?